Yes, customers have gone mobile and any small business without an on-the-go presence is missing out on business opportunities. Not convinced? Here’s some food for thought: back in the mid-1990s, many business owners thought they didn’t need a website. However, having an effective website is considered to be a key factor in a small business’ success today. Will the same be true for mobile apps? Count on it. To help you stake out your own spot in the mobile frontier, we’ve collected some of the best places to turn your website into an app for Android and iPhone. Our list includes some for any website and some specifically for WordPress websites. The list below contains solutions that enable you to create a mobile app that’s integrated with your website. These solutions also offer oodles of on-the-go functionality from menus to reservations, shopping, and scheduling to even offering coupons. It’s important to note that we’re not talking about responsive web design here. Responsive web design is an approach wherein your website is coded and designed to “respond” by rearranging and re-sizing itself depending on the type of device on which it’s being viewed. 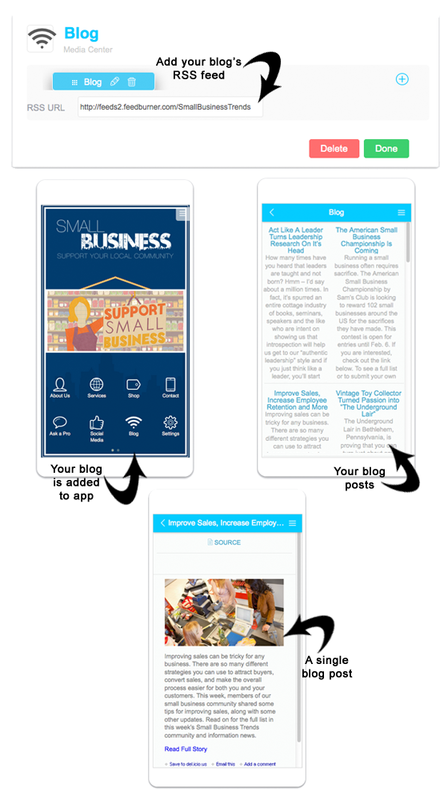 Responsive design makes your website look and operate better (think “user-friendly”) on mobile devices. A mobile app on the other hand, is a software application that you download from either Google Play (Android devices) or the App Store (iOS devices). 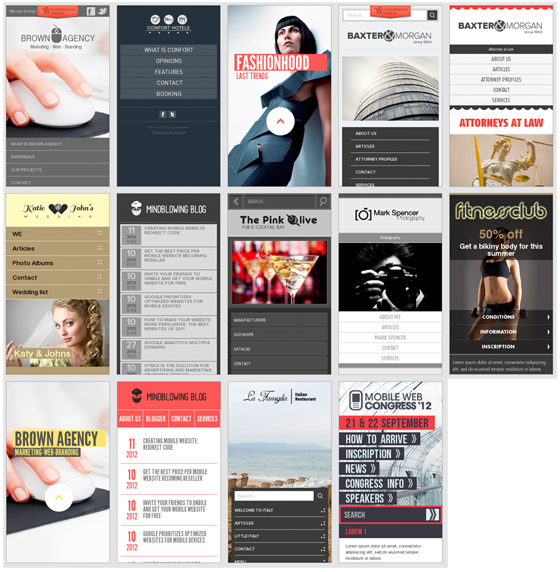 Apps are fully functioning entities that exist separately from, but can be integrated with, your website. So, why create a mobile app if your website is already responsive? An app is “native” to the device on which it’s designed to run so it loads and operates faster than a responsive website on the same device. 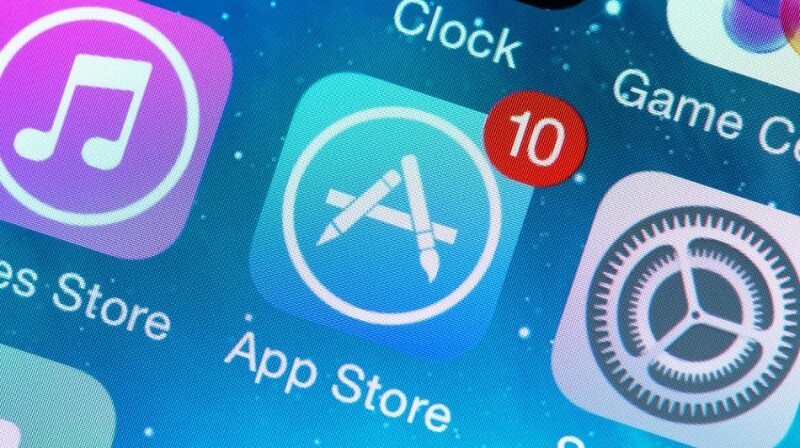 Additionally, an app doesn’t need an Internet connection to work, which means your mobile app can always be opened and used. This is handy when a customer is not connected and wants a critical piece of business info like your phone number. 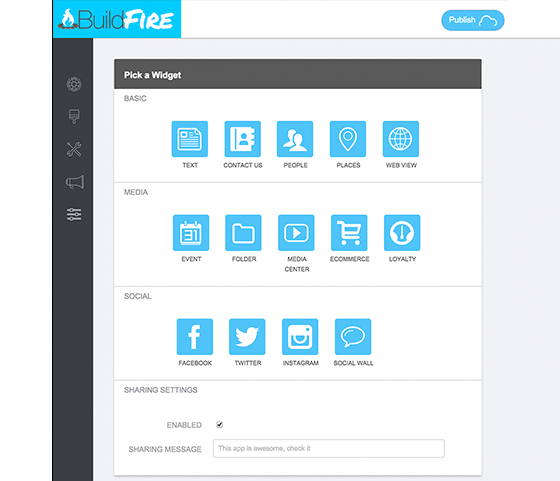 BuildFire is a richly featured, drag-and-drop solution for building a mobile app. The solution includes design functionality as well as options to add your brand images and select your brand colors. 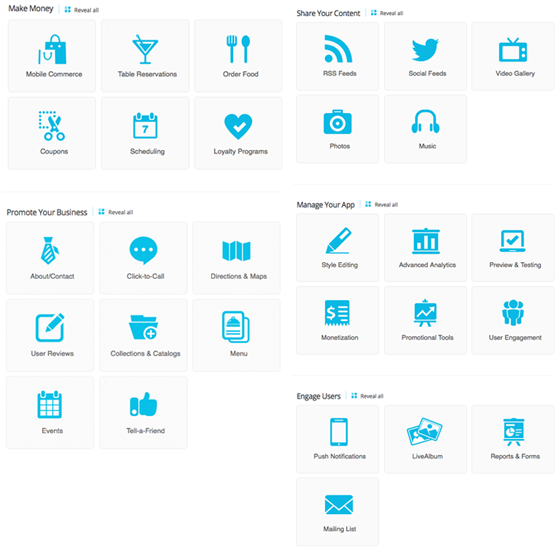 The image below shows the features you can currently add to an app using BuildFire. 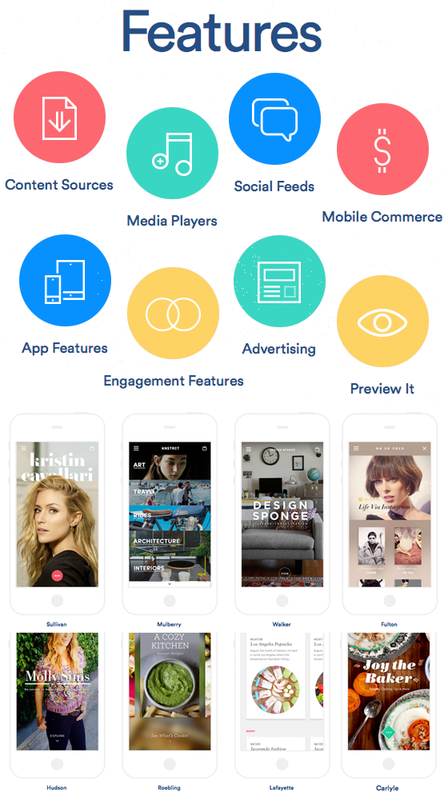 The “loyalty” feature stands out here as it enables you to create your own in-app point-based loyalty program. Como ups the app functionality ante by adding features such as reservations, scheduling, user reviews and more (see image below). Of course, blog and other feed content can be included as well. This is a robust solution and one that should suit a variety of small business. DWNLD is a newcomer on the scene. But that doesn’t mean it’s at a loss for functionality. Available only for iOS apps currently, this robust solution (look at the features and templates below) is worth keeping an eye on. SwebApps offers a couple of interesting features that we haven’t see elsewhere. 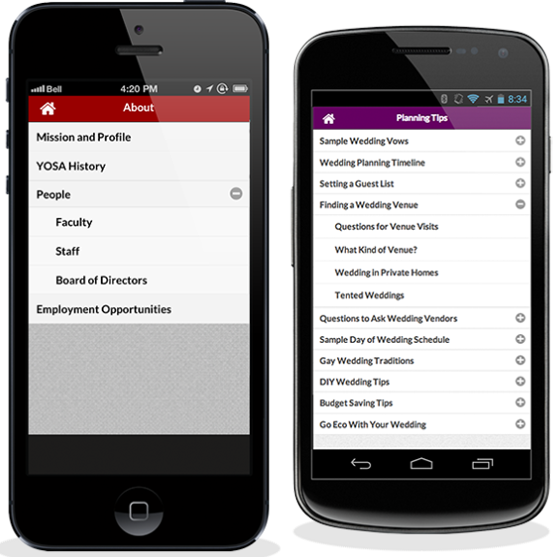 The first, shown below, is the ability to really organize information within your mobile app with lists. This is a really useful feature if you want to provide a useful resource for customers, even if they’re offline. The second feature is the calculator, which can be used for both tips (nice for a restaurant’s app) and for mortgages (great for, of course, real estate agents). If you like well designed templates, head over to Onbile where you’ll find plenty along with some useful basic app functionality. Another solid entry, AppMakr offers one feature we haven’t seen yet: in-app messaging functionality (a.k.a. notifications). An in-app message is a great way to catch a customer’s attention with say, a special offer. 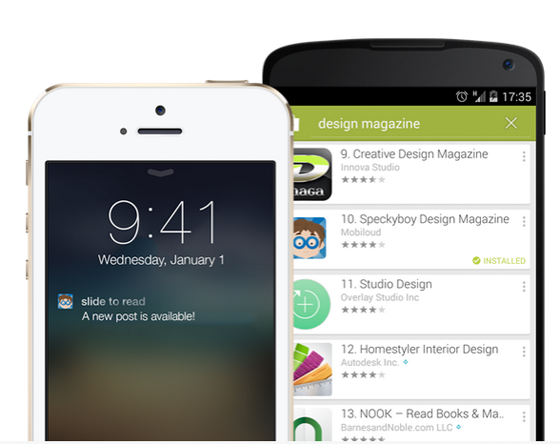 Both Mobiloud and IdeaPress enable you to easily create a mobile app that is kept up to date via a WordPress plugin. This keeps your app up-to-date whenever you update your site without having to go through any approval process from Apple or Google. Whether you provide products or services, mobile is quickly becoming a channel your small business cannot ignore. 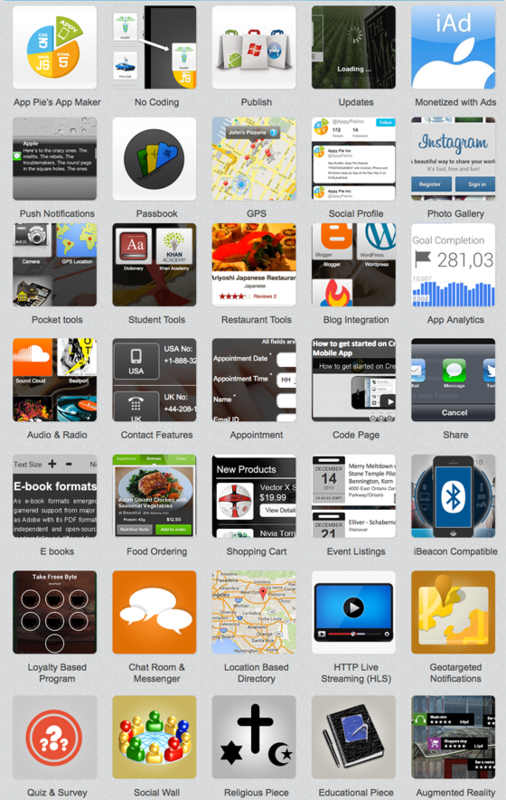 As the list above demonstrates, there’s no shortage of places to turn your website into an app for Android and iPhone. Most of the solutions listed allow you to try them out for free so take them for a spin to see just how easy it is to step into the mobile app frontier.